Medway Council has written a draft Development Brief for the Lodge Hill site. This sets out their detailed objectives for the proposed new settlement of Lodge Hill and its relationship to the surrounding area. 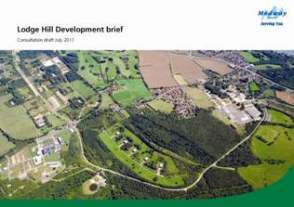 The Development Brief will serve as a guide for planning applications over the course of the development of the Lodge Hill site. It will also consider opportunities for integration with the wider area in the context of the council’s broader aspirations for the Hoo Peninsula. be notified of future consultations. You can also download a copy of the draft Development Brief (pdf 3,657KB) and comment using this response form (pdf 241KB). They would prefer to receive comments electronically, but you can also post them to the address at the foot of the page. There will be a number of events taking place during the consultation, where you can get more information about the draft Development Brief. The detailed background information that informed the Development Brief is also available to download. The consultation runs from 30 August 2011 to 14 October 2011. Comments received on the draft Development Brief will help to inform the final version. All comments must be received by 5pm on Monday, 14 October. They will not be able to take into account any comments received after this date. They are holding a number of exhibitions in local venues. At these events you will be able to speak to Council’s planning team about the draft Development Brief. If you cannot make it to one of the exhibitions, we will also be holding web chats via Facebook where you can ask questions and make comments. These will be from 1:30 – 4pm every Thursday from 5 September to 6 October. The web chats can be accessed through our Lodge Hill Facebook page. The Facebook page is also a good way to keep up to date with any changes and progress on proposals for Lodge Hill. For more information on how the proposals have developed, including the latest version of the masterplan, please visit the Lodge Hill website. This is an external website and the council is not responsible for its content. This entry was posted in Blog and tagged Lodge Hill, Planning. Bookmark the permalink. Further Proposals as to the alternative use of Lodge Hill for the actual benefit of those already residing on the Hoo Peninsula. Instead of developing a large new town on the doorstep of our hitherto rural villages, and thereby adding to the pollution of our area, why not turn Lodge Hill and the extensive MOD property surrounding it, which is unspoilt and rural and offering gorgeous views towards both rivers, Medway and Thames, into a Country Park? This could take the form of the Swiss ‘Trimm Dich Pfad’ (Keep Fit Trail). These Swiss Trails are in places of great beauty. They are quite lengthy walks/treks punctuated with very discreet, numbered ‘Keep Fit’ areas, either on or just off the paths. Each ‘Station’ has a piece of very simply constructed timber equipment. These vary in difficulty, as do the walks. Instructions as to its use are clearly written on an accompanying board. Shorter trails are suggested by missing out loops of certain numbered ‘Stations’. Overall there is something suitable to challenge all ages. It is just a matter of choice. In view of the worrying extent of obesity apparent in Britain to-day, affecting all ages,( not to mention the money spent in the NHS to attempt to address this problem), surely ‘Lodge Hill’ would be better used for development as a Country Park/ Green Gym. A project such as this would be welcome and of real benefit for the existing population of the Hoo Peninsula as a whole. We would also suggest the possible addition of a Healthy Eating Restaurant (e.g. a really long Salad Bar, offering imaginative and wide gourmet choice). The Lodge Hill area could also be the site of a much needed Medway Community Healthcare Healthy Living Centre to serve the Hoo Peninsula (as already exist in Gillingham, Lords Wood and Parkwood) and possibly an ambulance station. Even the Prime Minister is quoted as saying ‘environmental benefits of developments will be assessed before new projects are given permission’. He is also reported as saying that he is ‘committed to the beautiful countryside’ and that the ‘beautiful British landscape is a national treasure’. Subsequent to filling in our Response Form re ‘Lodge Hill Development Brief’, we decided to drive down Lodge Hill Lane to look more closely at various map references and plans referred to on the brochure we had been given by Medway Council. We went as far as we could before the winding little public road came to an end and we then continued on foot. It was a lovely morning but as we wandered across the fields on the outside of the fenced perimeter of Lodge Hill, on quite high ground, we weren’t prepared for the sheer beauty of our surroundings, in general, and the area around and beyond Wybornes Wood, in particular. (According to the leaflet, this particular area of outstanding beauty has been designated as a potential location for one of the three new secondary schools. This wood runs alongside the top perimeter fence adjoining the Osenton farm down Wybornes Lane off Cooling Road, ) The views were outstanding, taking in both the Medway and the Thames, rural, quiet, peaceful ___ just sheep grazing tranquilly! It took our breath away. We ended up walking quite a distance and we so wished we had taken a camera with us. We could even see High Halstow and our own house standing out clearly, and certainly much nearer to the proposed development than we had ever visualised. This area, already inviting one to explore its different walks and attractive oak woods, and, at the same time, offering peaceful ambience ,(not a lorry in sight or earshot!) plus magnificent views, could be the perfect setting for a really lovely Country Park. We don’t think the people on the Peninsula have any idea what an opportunity is being snatched away from under their noses by this development, because, having been set aside by the MOD for use as a military training area, the general public has not had access to it. What a well kept secret it has become! We feel sure it could be put to much better use as a superb site for a Country Park/Green Gym for the residents of the Hoo Peninsula as a whole to enjoy and at the same time it would be sure to attract visitors to this part of Kent, thus being of benefit to a much wider community. We feel even more strongly that this proposed development should be at least reconsidered, with the possible option of creating a superb Country Park/Green Gym, and then, hopefully, withdrawn altogether. See attached copy of our letter (of 20 Nov. ’10) to Mark Reckless MP, for our thoughts on the broad concept. The A228 is the artery to the Hoo Peninsula. If that artery is blocked or congested, there could be dire consequences for the safety of those of us living on the Peninsula. We do live in an area of several potential safety hazards. •	During construction (over several years) there will be congestion and obstruction on the main road at the Wainscott roundabout and particularly on Dux Court Road. There is considerable congestion at the former already. •	Public transport to the Peninsula is already inadequate. This situation will be exacerbated. •	Medway Hospital is already overstretched. The addition of a town twice the size of Hoo St. Werburgh would place an intolerable burden on the Hospital, no doubt resulting in even longer waiting times for appointments with consultants or operations. •	Our present medical practices on the Peninsula are already working at full capacity. They will be overstretched during any development period (which could stretch over years). •	It is hard to see how present education facilities will cope with such a development. •	There appears to be no specific provision made for the established Church of England or any other faith. •	It is hard to see how such a development will be prevented from becoming a commuter town. In the light of the recent governmental announcements on planning restrictions, it is easy to visualise the new development becoming one large formless conurbation of Strood. •	If the ‘Wish List’ drawn up by the working party were to be honoured, even in part, it is difficult to see how there would be sufficient finance available for the necessary ongoing upkeep (e.g. road maintenance, already inadequate, etc.) of the already existing villages. They could fast become the poor relations. •	Lodge Hill is not a truly brownfield site. It would be much more enlightened and environmentally friendly to develop it in keeping with the other protected environments on the Peninsula to make it a coherent wild life area for visitors. •	To remove this potential ‘lung’ (i.e. Natural unpolluted green area) would be detrimental to the general health of the area. •	Lodge Hill is also a site of historical interest, particularly its Dockyard connections. These would disappear in development. Are the buildings listed in any way? •	Public transport to the Peninsula is already inadequate. The introduction of a large town in the proposed location could only be to the detriment of the present system and increase the already considerably heavy-weight traffic on our roads. •	Despite the industrial development already on the Peninsula the area has a strongly quaint and relatively unspoilt rural atmosphere of its own. The farming community still has a strong influence on community life. In our view, this town would destroy the rural character of our area. You will see that we are completely opposed to the proposed development and trust that these views may be represented by you in due course.